This is the last blog post about the engagement party we hosted last weekend for my oldest son and his fiance. I have a few more details about the decor to share and specifics about the menu and bar. You can also read my earlier posts about the Engagement Party. Ok, so how adorable are these cookies? 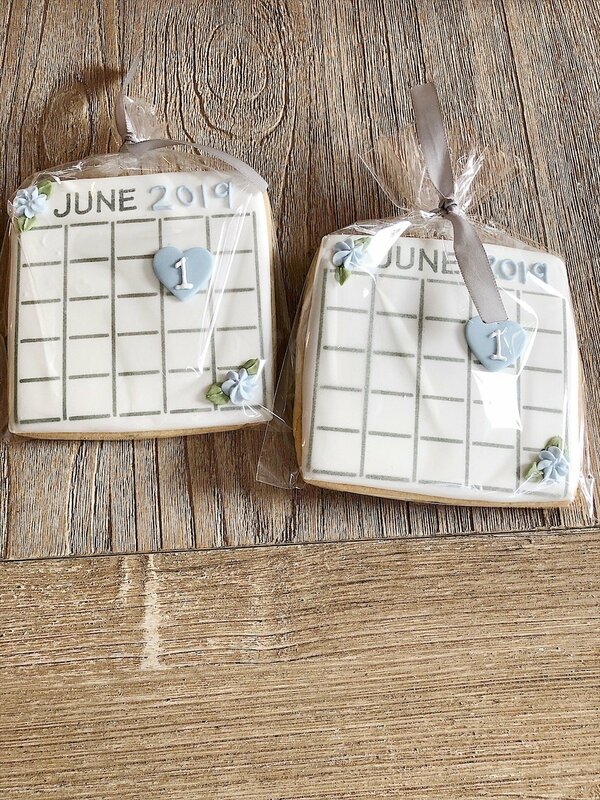 I found cookies like these on Pinterest and was thrilled when I found @designer_cookies to make them for me! 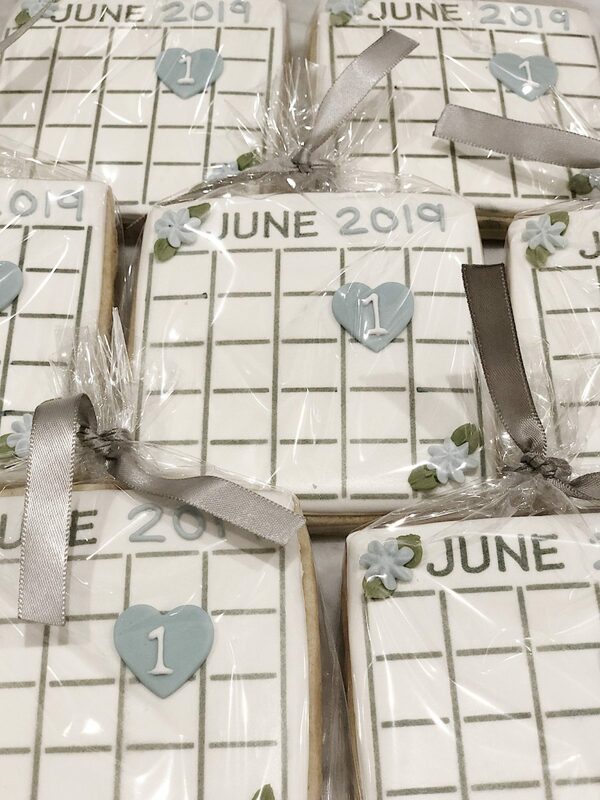 These were the Save the Date giveaway gifts for all of our guests as they left. Hopefully, they were eaten too. I hear they were delicious! As I was planning the decor for the engagement party, I wanted to include lots of surprises for the bride and groom. One of the ideas that I came up with was to create pillow covers that were special to the bride and the groom. 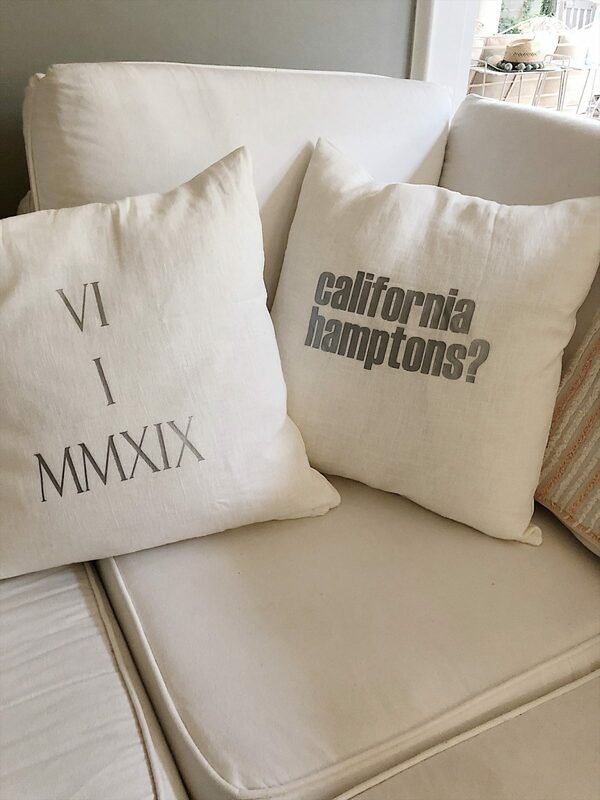 These pillows feature the wedding date and the humor of our “California Hamptons” theme. 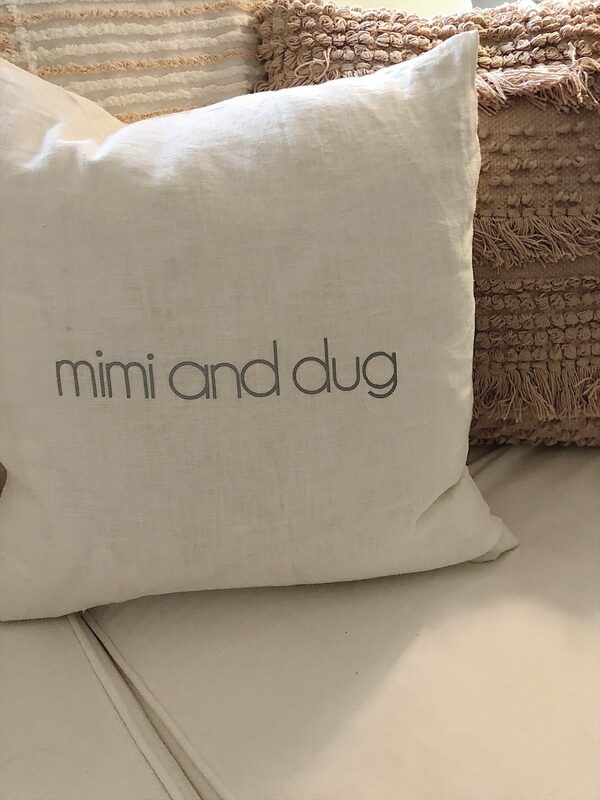 I also made pillows that feature their cat and dog names. When the party was over I gave the pillows to the bride and groom to be. 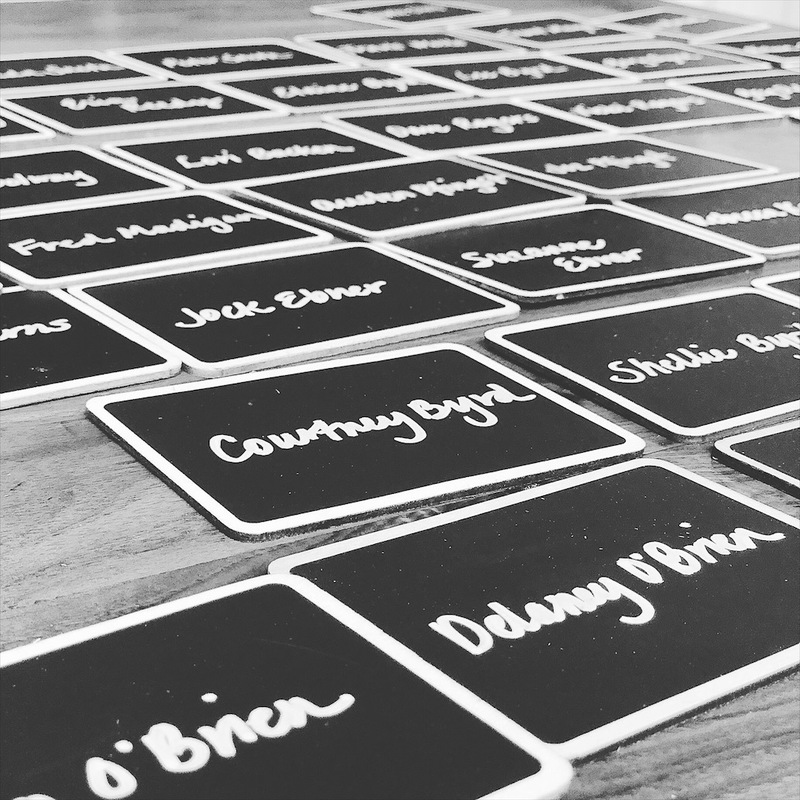 I hand wrote the place cards on small chalkboards that I purchased here from Amazon. They were .50 each and came with some really cute easels. Unfortunately, it was a bit breezy when we were setting the tables so we didn’t use the easels. I made some chalkboards for the party. My favorite one was the Special Cocktail list at the bar. 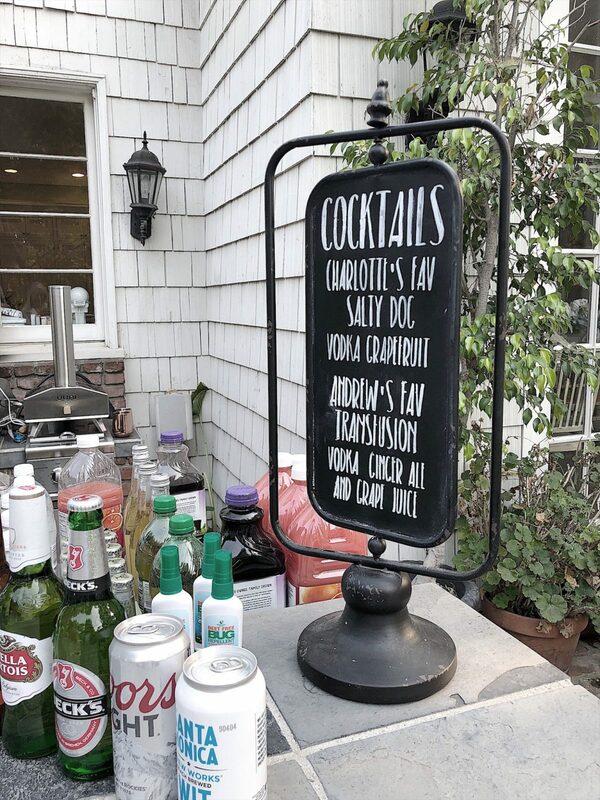 We featured the favorite drinks of the bride and groom to be. To make the chalkboards. I cut a stencil on my Silhouette machine and then used liquid chalk to make the sign from the stencil. I also had some personalized frosted cups made that we used at the bar. How adorable are these? For the first time in a gazillion years, I did not cook all of the food for a party. I really wanted to focus on the setup and the decor and hired a good friend and her catering company, Craig’s Crew, to handle the food. There was one exception, I did make my famous Crab Cake recipe. I made about 140 crab cakes and if you haven’t tried this recipe, you have to make them! The menu was based on our California Hampton’s theme and the preferences of the bride and groom to be. Andrew’s first solid food was ice cream (I know, I am a terrible mother) so that’s why we had an ice cream bar for the dessert. I am not exactly sure what I was doing while the food was served because I do not have a single photo of the buffet, appetizers or dessert bar. In fact, I actually never saw the dessert bar. Not once. How funny is that? But I can tell you the food was fabulous and everyone loved it. It really was wonderful to know that Craig’s Crew would serve a fabulous dinner. And they did! It’s time to close this chapter on the Engagement Party. I feel like I have been talking about the party for a month when it has only been a week and a half. Planning this party was the most incredible experience. It was a group effort as I had so much help from family and friends. Being able to create a magical evening for Andrew and Charlotte was my goal and it truly was a dream come true. Thanks for joining me on this amazing journey. Congratulations on an amazing job. I have loved every minute I have spent following your progress! What a good mama you are to do all of that work for your son and his fiancé! Everything looked beautiful and I can see why you wouldn’t have time to cook! I wish I was as crafty as you. 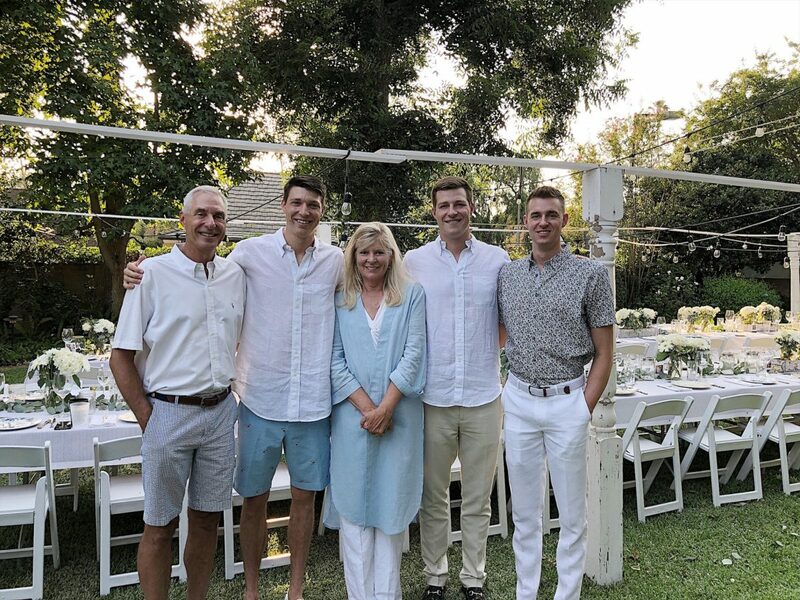 Anyways..are those all of your sons and hubby in the last picture ? How handsome they all are. You must be very proud ! Congrats! Love the outdoor room! Half the fun of something like this is the dreaming and planning that go into it, then finally seeing all that come to be is awesome! I loved following your party details. Can you tell how you made your pillows? They were adorable. You did a fabulous job. Loved all your creative ideas. Please tell me how you personalized the pillow covers. Did your order them or was it a diy? Just did my first invite thru Leslie’s recommended site, Paperless Post!!! It was really fun. Took some time, only because I had to add to the address book, but great! After seeing Leslie’s party, I had the itch to plan something. So a chili cook-off it is! October tho!! Let the planning begin!!! Need to find that cute chalkboard!!! Beautiful job Leslie! Everything looked wonderful. Once again You nailed the festivities frim A-Z. BTW…What a handsome couple they make! June 1 will be here before you know it! 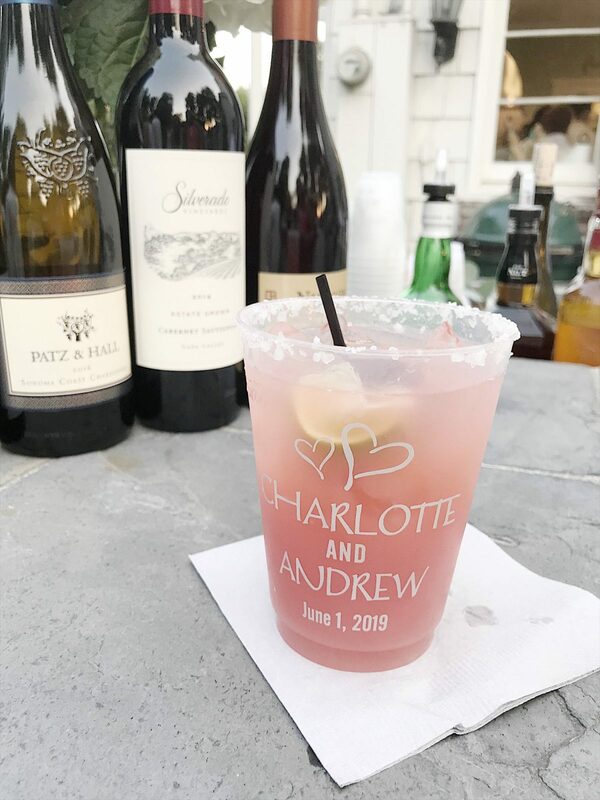 As a former wedding coordinator at a country club I loved following your stories for this event! Kudos for an amazing job. And, I’m still ooooing and ahhhing over those flower arrangements! I love your future daughter in laws dress. Can I ask where she purchased it? Your blog was unbelievable and the work in planning the party definitely shows. Looking for tutorial on how you made your cute pillows with personalized lettering. When I search “pillows”, it brings me back to your engagement party post. Did I miss a step? 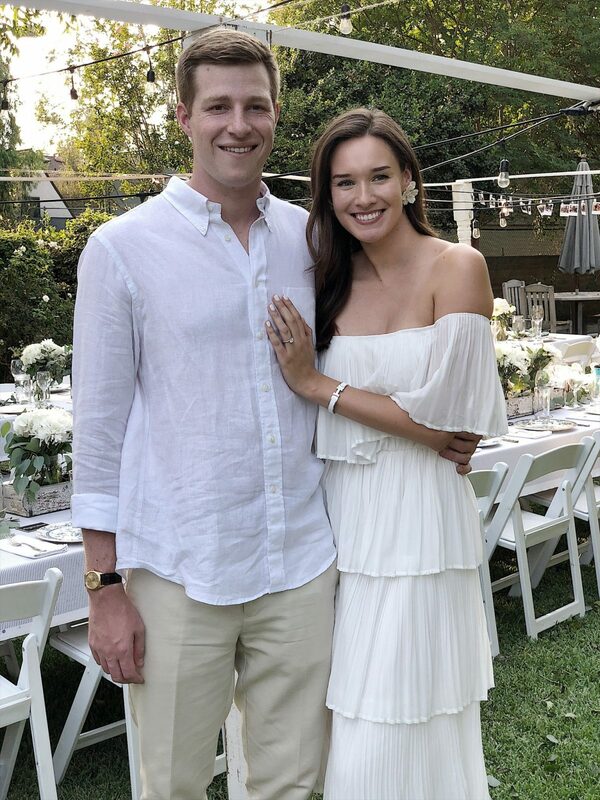 Wow, stunning like always even on your social events!!! Your son and soon to be daughter-in-law are so blessed to have you!! Congrats!! Looks like it was an amazing part Leslie. Congratulations to your son and fiancé! Leslie you are so talented. Your blog and IG posts are my favorite to read. Always learning something new. Thanks for sharing! Thank you for all your great ideas. 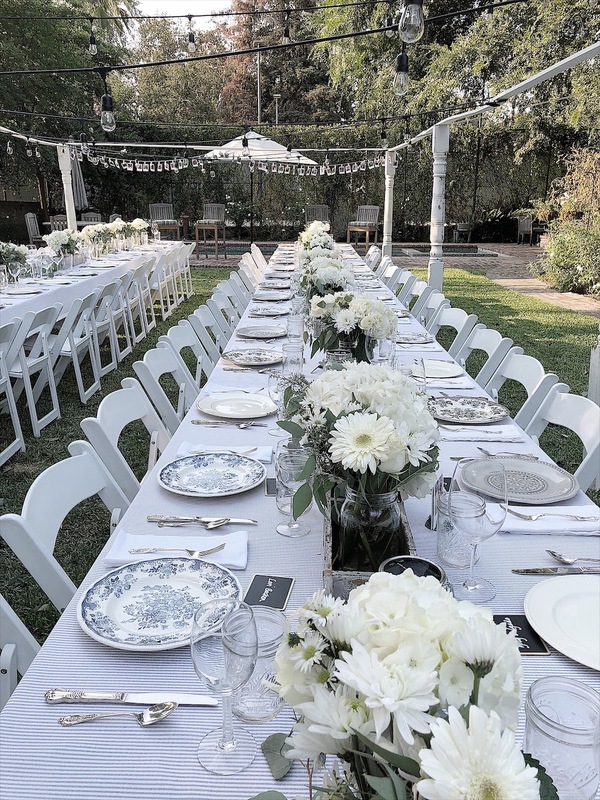 My son gets married in October and I am planning on using a lot of your ideas (or all your ideas, lol) for his rehearsal dinner.